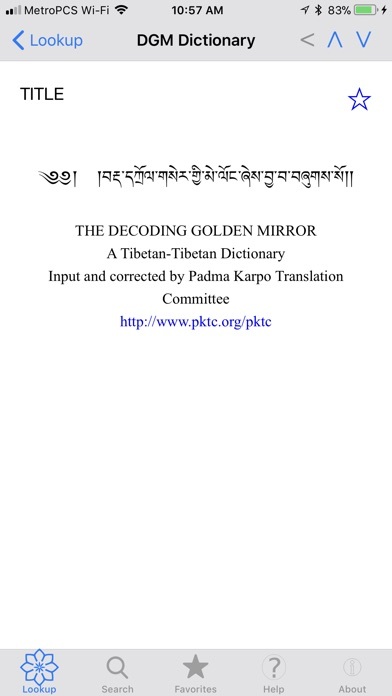 The Decoding Golden Mirror dictionary specializes in older terms which are often used in dharma texts but hard to find in normal dictionaries. The dictionary is Tibetan-Tibetan so it is not for novices. However, for those doing serious work it is a gem. One of its features is that it gives quotes from various other dictionaries or texts to highlight the meaning of words. Unlike the Tshigdzod Chenmo Tibetan-Tibetan dictionary whose very pithy entries can make it very difficult to understand, this dictionary has much longer entries with very clear illustrations of the meaning. Here is an example illustrating those features. This is the text of the first entry: Ka: Here is what it says. 1) Ka is used to mean (don la ’jug pa) “desire”; it says in the Correct Lettering Well Explained Dictionary “‘ka’ is for desire”… The dictionary contains about 5000 entries. We strongly recommend this dictionary as a basic tool for any serious translation work.